While there are many types of microphones available, we are going to concentrate on the two common microphones used in the meeting and event industry; the handheld and the wearable. Both of these styles of microphones come in wired and wireless versions. 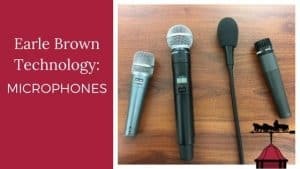 The most popular are the wireless version of the wearable microphones and the wired handheld–which are common on podiums and microphone stands. Handheld microphones are commonly used on podiums or panel tables to aid multiple speakers in the same location. They are also used wirelessly for audience participation. This microphone works well for seminars with multiple speakers when presenters must pass the microphone to others. They are also great for someone who isn’t used to speaking in front of groups. Handheld microphones pick up voices very well and come in a variety of styles. At Earle Brown, we also use this microphone style for weddings, instruments, and singers. Some professional speakers like to use wireless handheld microphones when speaking because the style gives them more options for effects and interacting with audiences. This type of microphone is either clipped on the speaker’s clothing or worn as a headset. They allow the speaker the most freedom for movement and interaction. The clip-on style is commonly referred to as a lavalier microphone. At Earle Brown, we prefer using a head worn microphone. Our choice of style is the Countryman by Shure. This microphone is great for presenters that move around or for newer presenters that haven’t worked on their body language or movement and don’t know how it will affect the microphone. Wireless technology has changed a lot over the past few years. The battery life is not a huge concern with newer microphones as it was in the past. New digital microphones are working well without the crossover interference the old UHF models experienced. Wireless mics have become very reliable and are available in many options for style, size, and polar pattern/response. To get the correct microphone for your meeting, consult with the audio-visual expert at your event location. Are you recording the meeting? How many speakers are you planning and what is their rotation? If a speaker from your company will be presenting, understand their public speaking comfort zone; would they prefer standing at a podium, do they tend to make lots of hand movements, do the speak in a quiet voice, etc. Are you having a question and answer session? If so, will you want extra microphones to give to the audience or have the audience come up to the microphone? As with any event, planning is vital. Knowing how your event will run and in what order your speakers or agenda will be moving is key. If you have any questions about microphone usage or the capabilities of our venue, contact Earle Brown Heritage Center by submitting a form or giving us a call at (763) 569-6300.